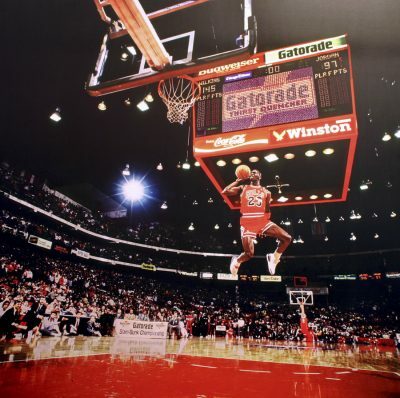 Since the NBA instituted the slam dunk contest in 1984, few events have bridged the gap between professional sports and pop culture like some of the game’s biggest stars showcasing their abilities in a sold-out arena. Slam dunk contests of the past have consisted of music and television’s most prominent figures sharing nearly as much time on screen as the dunk contestants, and there’s no doubt that seeing a reaction from Jay Z and Beyoncé after a windmill dunk is entertaining. Watching celebrities react to creative and athletic dunks offers a window into their personalities, which only makes the experience all the more exciting. But as the dunk contest has evolved throughout the years, so has the integration of pop culture within the event. And this past year’s dunk contest evidenced that the merge must cease. When Donovan Mitchell, Dennis Smith Jr., Larry Nance Jr. and Victor Oladipo were announced as this year’s contestants, I was thrilled. Four young, athletic and developing stars in today’s NBA were prepared to take one of the biggest stages throughout the season to put their dunking abilities on display. I couldn’t wait. When the judges were announced, however, my reaction couldn’t have been more opposite. Sitting behind a courtside panel alongside Lisa Leslie and Julius Erving were DJ Khaled, Mark Wahlberg and Chris Rock. DJ Khaled, Mark Wahlberg and Chris Rock. Sitting next to two of the best basketball players of all time. Evaluating a dunk contest. Aside from how unqualified three-fifths of the panel was in this year’s dunk contest, the NBA compromised the integrity of the competition by integrating celebrities that viewers knew into the contest. While watching the competition, I found myself constantly disagreeing with the judges’ evaluations of dunks. Some were extremely generous, handing out 10s, and it almost felt as though the judges did not have a grasp on the history of the dunk contest or what a 10 truly looks like. You can’t tell me that some of the 50s received by contestants in this year’s dunk contest were even remotely on par with some of the great Michael Jordan and Dominique Wilkins dunks in the ‘90s. In past years, the NBA’s viewership has increased significantly, and the league has made a concerted effort to connect with both younger and older audiences. I understand the league’s intentions, and I understand that it is an entertainment business. However, for the sanctity of the game and the integrity of the dunk contest, it is crucial that the league keep celebrities out of the judging panel. No matter what anyone says, DJ Khaled is unfit as a dunk evaluator. All-Star Weekend should not have to be dumbed down in order to appeal to a broader audience. Maybe integrating superstars in today’s game would provide similar entertainment value while also keeping the purity of the game intact. Seeing some of pop culture’s biggest stars react to dunks courtside is entertaining, but when they enter the evaluation booth, the quality of the event diminishes. I urge the NBA to find an alternative to including celebrities in the dunk contest, and find more qualified judges who know the event and more deeply understand its historical context.